Is it worth £30m to shut them up? British parents are forking out an average of £34 as a result of accidental in-app purchases made by children using their smartphones and tablets, research from Microsoft has claimed. The study from Windows Phone UK found that parents across the nation have ended up forking out a total of £30m as kids unlock levels, or buy coins or obtain other in-game items without their permission. According to the research, over a quarter of parents with smart devices have been caught out, while 80 per cent of those have seen higher bills as a result. It's those pesky 8-year olds who're doing the most damage, the Microsoft report found, costing parents a somewhat hard-to-believe £59 on average. OFT smackdown on the way? 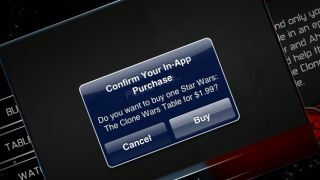 The subject of in-app purchases has been in the news quite a bit recently after parents who'd failed to switch them off or at least use a password to protect them, were met with huge bills. The UK's Office of Fair Trading has launched a probe to ensure game developers aren't deliberately target children and putting parents under undue pressure to cough up dough as a result. Brett Siddons, of Windows Phone UK said in a statement: "Parents are worried about the impact of app and in-app purchases on their bills and this can cause stress. "With technology becoming more and more intuitive, it's important that parents can trust in the technology they use." Microsoft, of course, has nothing to gain by trying to foster the mistrust of the in-app purchase system that Apple has taken much of the criticism for creating. Nothing to gain at all.